The end is definitely nigh for Walter White, Jesse, and so it seems Mr. Goodman at the start of this episode. We finally get to see one of the guys Saul knows to make a person disappear and what that disappearance entails. We also get to see what Jesse's life as a prisoner is like with Jack, Todd and the rest of the Aryan Brotherhood. While Breaking Bad was making it's dominance know at the Emmy's, Walter White and Jesse Pinkman were being tested as they have never been tested before. When this episode begins we see out favorite quick witted lawyer Saul Goodman being forced to use one of his infamous "guy, who knows a guy" for himself and he gets a ride in that burgundy van Jesse didn't take, and Walter White did when all came crumbling down. The "guy" in this episode is a pretty well known actor who seems to always be cast as that kind of guy. Robert Forster, best known to younger folks as the bail bondsman from Jackie Brown plays the Vacuum cleaner sales and repair person that provides the service of making wanted fugitives of justice, disappear. Because of the downfall of the Crystal Ship Empire, Mr. Goodman has to close his doors and share a room with Walter over at the Vacuum shop while awaiting his relocation. To this point, Walter has let everything slip though his fingers, his empire, the "train" referred to after he took down Gus Fring has been stopped. "Nothing stops this train", except the DEA and the Aryan Brotherhood and we see his frustration and fallout through most of this episode. He even tries to pull another Heisenberg moment when alone with Saul in the vacuum/relocation shop and can't even do that without being interrupted by a cough that makes him collapse and give Saul his getaway. 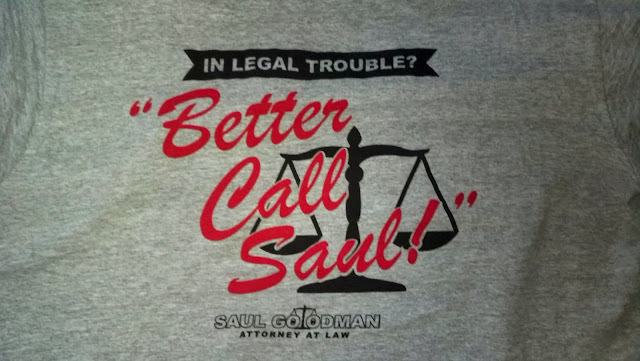 So long Saul, we'll catch you in your spin off show. Retired as of "Granite State". Meanwhile, Skyler is sitting through interrogation and Marie is still letting her husbands death sink in, but that's pretty much all we need to know about Marie for now. Jesse is living his own private hell, being forced to cook Heisenberg level meth under the thumb of crazy eyes Todd. They keep him in a cold stone underground cell, rewarding him with ice cream with his successful cooks, while Jack and the crew laugh about Jesse's DEA confession DVD that was raided from Marie's home. No one seems safe from the hands of Crazy Todd and his uncle not even if the DEA has you under surveillance as we find out when Holly and Skyler also got a visit from Todd to let her know if she rats on his favorite tea sippin' gal ,(Lidia), her and Holly are done, and we know Todd has no qualms about killing kids since he's already killed one before. Walter White's current existence in his newly relocated home of a cabin in the woods in New Hampshire shows a broken down and beaten, lonely, old sick guy who's just about given up. He tries to reach out to Walt Jr. (who goes by Flynn officially now according to his school's intercom announcement), and gets yelled at because he cannot forgive the death of his uncle Hank. With all lost, Walt sits down to do some hard drinking when he catches some news about his former friends company "Grey Matter". They discuss his case on air and their relationship to Walter White and insinuate his only contribution to the company was the name, and that the man they knew is no longer, only Heisenberg exists. This ignites something in Walter, like it offends him to say he was not more that just the the guy who came up with a clever name. We hear some familiar music as he ruses the law to his location as we leave this episode in what looks like everything that happened before he gets to Denny's for some coffee, eggs, and an M-60.